Did they (anyone..) ever make tis in styrene,think someone did but might have imagined it - my memory was never great and post stroke.......now what was I saying. 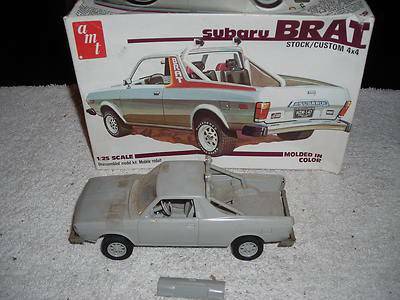 Nigel, Yes, AMT issued a 1/25 Subaru Brat in the early/mid-1980's. I have seen rumors on another model car forum that the molds for this kit were found to be in good condition, and that it is on Round-2's list of possible reissues, maybe as soon as early next year 2019! For some reason, I can remember this being an MPC kit. Whichever, I really could use one if Round 2 reissues it! Real glad I did not imagine it,found the same pic btw! No, it was first issued by AMT Corporation. Oh, yes, yes they did! It's a cool car/truck/whatever indeed, and I'm happy it's coming back, too! Faust: Metalhead, Poncho fan and modeller of the ecclectic (and lame). Check out my other reviews at The Sprue Lagoon! The BRAT is scheduled for release this year.